Why isn't the Keystone pipeline extension going to eastern Canada? So much of the discussion surrounding an extension of the existing Keystone oil pipeline system which spans Canada and the United States assumes that the growing production of bitumen (it's not really oil) from the Canadian tar sands is either going to the United States or to China. But the following question ought to be an obvious one to anyone who knows that Canada imports 43 percent of the oil it consumes: Why isn't there any discussion of a new pipeline to eastern Canada where most of the oil consumed is imported? RELATED UPDATE October 21, 2012: Canadians could free themselves from oil imports, but will they? Most of Canada's oil wealth is found in the western part of the country. 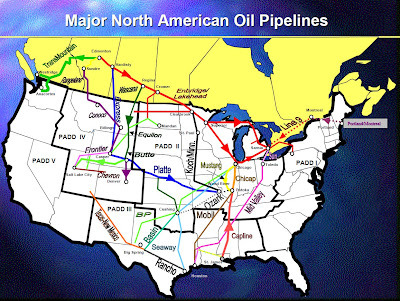 And, nearly all of the pipelines run north/south, exporting much of that oil into the United States. When one asks why this is so, the answer given is that this is what has proven to be most economical. Western Canada exports its oil to the United States. Eastern Canada imports most of its oil from abroad. That works fine until there is a disruption in supply. This year, in particular, ought to give Canadians cause for worry given all the social unrest in the Middle East and the civil war in Libya which resulted in substantial output losses. When Canada's oil riches are combined with its abundance of natural gas--it exports half its production to the United States--and its large deposits of uranium and coal, the country ought to be energy self-sufficient. So, why haven't Canadians pursued energy independence? One member of the Canadian parliament thought he had an answer all the way back in 1972. Don't worry too much if you can't follow his discussion of oil company takeovers at the time. His conclusion, however, is quite clear: The Canadian oil industry is largely foreign-owned and serves the needs of its corporate masters and not those of the Canadian people. Little has changed since then. The current Canadian government seems nothing more than a subsidiary of the international oil industry which finds it more profitable to ship Canadian crude oil out of the country and add value to it through refining operations elsewhere. So complete is the control of the industry over the government that a witness before a parliamentary committee who broached the subject of Canadian energy independence was told to cease his testimony, and the hearing was immediately adjourned by the Conservative Party chairman who presided. What might the advantages of building an east-west pipeline from the tar sands to eastern Canada be? Of course, there would be many Canadian jobs created by the building of the pipeline, and that would also benefit the government through increased tax revenues. Ports in the east might become oil export terminals instead of import terminals. Canada would likely build more domestic refinery capacity, both to supply its own needs and to export refined petroleum products. That would lead to yet more jobs for Canadians and yet more tax revenue for their provincial and federal governments. And, that would mean better financed public services for all Canadians. Naturally, the large international oil companies that control most of the Canadian oil industry want to avoid the high taxes generally levied throughout Canada. Better to ship oil to the lightly taxed United States, refine it there, and sell it back to the Canadians or whoever offers the highest bid. NAFTA also prohibits Canada from charging a lower price to domestic oil consumers than to those purchasing exports. It's common practice for countries that are self-sufficient in oil to give domestic oil consumers a discount from the world price, in essence, to control domestic prices. Back in March of this year when vaulting oil prices pushed up the cost of refined products such as gasoline, residents in some oil-rich countries hardly noticed. Kuwaitis were paying 81 cents per gallon for gasoline. Saudis paid 45 cents. And, Venezuelans were paying just 6 cents. Since Canada imports so much of its oil, it has little choice but to accept the world price. (It could subsidize oil using funds from elsewhere in the economy, but that would be extremely costly.) Whether it is good policy to provide low-cost domestic fuel is questionable since such a policy tends to encourage profligate use. Some exporters that could easily afford low domestic oil prices choose just the opposite course. Norway, the world's eighth largest oil exporter, was charging $9.27 a gallon (including taxes) for gasoline in the same March survey mentioned above. The point remains, however; Canada currently has no choice. Its energy sovereignty has been severely restricted. Of course, Canada could withdraw from NAFTA by giving six months' notice. This might prove painful as the United States would likely retaliate in several other areas of trade and reciprocal relations. In the alternative, the Canadian government could reopen the NAFTA agreement and alter the section on petroleum to allow it to route some or all of its increasing tar sands production eastward within Canada. But, don't look for this to happen anytime soon. The impression I get is that most Canadians do not even know that their government has essentially given away their energy sovereignty to the United States through NAFTA. The onesidedness of the agreement was made plain by the U.S. rejection of Chinese National Offshore Oil Corporation's attempt to buy U.S.-based Unocal. There was overwhelming political opposition to this acquisition--even though Unocal had relatively small domestic operations--because the takeover represented an attack on American energy security. Any foreign power seeking access to American oil is probably facing an unwinnable fight. Canadians, however, are basically helpless in the face of American demands for Canadian oil. 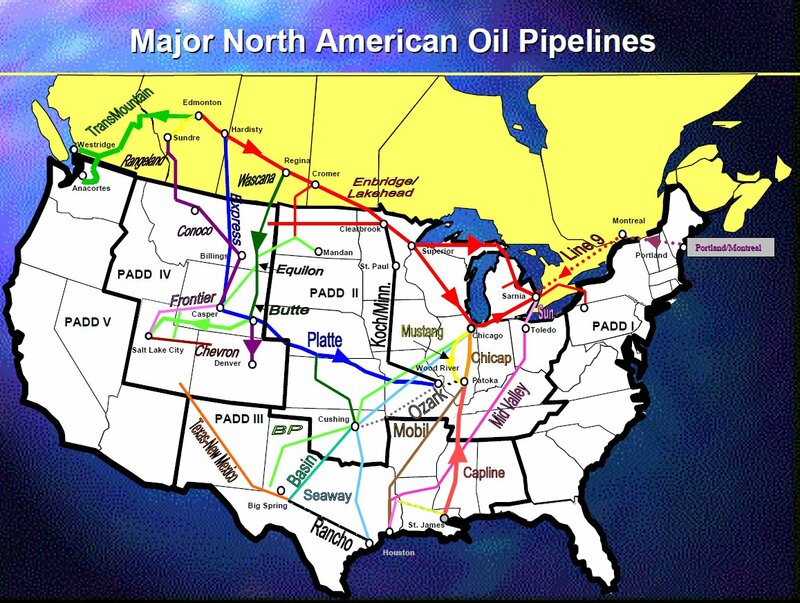 No wonder American politicians speak of Canada's resources as if they are located inside the United States. Many who are protesting the Keystone XL pipeline--the formal name for a project to extend existing pipelines that would increase the export capacity of the tar sands to the United States--don't want it because they believe tar sands production produces significantly higher greenhouse gas emissions versus conventional oil production. Some also object to the wholesale destruction of forests, cleared to make way for tar sands mining operations which then cause air and water pollution. To this list of concerns, Canadians should add a query about why their patrimony of oil resources is being shipped to strangers when so many Canadians remain dangerously exposed to disruptions in oil imports transported from faraway sheikdoms. There is no good reason why Canadians must bear such a risk. But there is one bad reason: Canadians have lost control of their energy resources, and those resources have long ceased to be managed for their benefit. Which begs the question: Would Canadians want that control back if they understood their predicament correctly? The Roman Emperor Titus Flavius Caesar Vespasianus Augustus, known to us as Vespasian, was responsible for the building of perhaps the most recognizable man-made structure on Earth after the Egyptian pyramids, namely, the Colosseum. So massive is the structure that a fire, an earthquake, the pilfering of its iron supports, its use as an aboveground quarry for hundreds of years and 2,000 years of weather have nevertheless left much of it standing. When it was new, it was said to hold 50,000 people. Today, millions of tourists still visit and walk on its remaining structure every year. [W]hen Vespasian was offered a labor-saving machine for transporting heavy columns, he was said to have declined with the words: "I must always ensure that the working classes earn enough money to buy themselves food." Of course, Vespasian had to contend with a slave workforce which he needed to keep busy and free working-class Romans who needed to be fed. We don't allow slavery (unless you count the sweatshops of the world as its successor); but the idle workforce, especially of the unskilled, continues to expand. I was reminded of Vespasian when Charlie Hall, perhaps the best-known energy researcher you've never heard of, commented at a recent conference that we have built a society where fossil fuels have consistently displaced labor. This has had the unfortunate result that those whose primary aptitude is with their hands are finding less and less work. Of course, much of the manual work which used to be performed in the United States is now done in the Far East, particularly China. And, the kind of work that most factory workers do there might very well be considered drudgery by many people. Hall's point, however, was two-fold. First, impending declines in available energy to society will likely force such work closer to the markets it serves. This is because rising transportation costs will diminish the advantage of worldwide manufacturing webs in favor of regional and local ones. Second, manual labor often requires skills that we in the United States do not teach as widely as we used to. We aren't ready to make the things we once made. And, all of this remains true even as the ranks of the unemployed swell and energy costs continue to climb. Certainly, Vespasian's attitude would have prevented the immense advances in productivity of the modern age. But since those advances are largely premised on the growing availability of cheap energy inputs, we may need to re-examine our attitude as those energy inputs become constrained and thus are no longer cheap. Moreover, continued policies that lessen opportunities for manual labor will, of necessity, doom an entire group of people to the unemployment rolls just because their intelligence shows through in what they make with their hands rather than what they say or write. I am not here romanticizing backbreaking labor. The one place that mechanization has failed to progress very much in the last few decades is the picking of fruit. Researchers had been looking for ways to harvest fruit mechanically. But an onslaught of cheap immigrant labor into the United States from the 1980s onward pushed real wages down for farm labor so far that mechanized fruit picking did not seem worth the effort. Even in the exploitative world of farm labor the laws of supply and demand apply. An avalanche of new workers depressed wages and doomed the mechanization effort. We may be facing something similar in the next decade. The financial turmoil of Europe is but the latest chapter in what I believe is an unfolding depression that will take many years to resolve itself. It is worth remembering that as late as 1931, no one alive back then thought they were in a depression, let alone what would come to be called the Great Depression. Back then, of course, governments engaged in very little of what we would call stimulus, and central banks did not regard it as their purview to save the economy and provide full employment. We have bought some time with countercyclical measures from both institutions. But now the effects are running out, and we must face the consequences of too much debt and not enough cheap energy. During the Great Depression President Franklin Roosevelt proposed and implemented huge government works programs, the results of which can still be seen today in forests that were replanted and dams that were built. Such programs put people to work on useful public projects largely with their hands. Advances in productivity are useful, but useful work is more important to the human psyche and thus to social stability. In the coming era of limits we will need to rely less on fossil fuels and more on each other. "Idle hands are the devil's playground" will become more than a trite aphorism if we do not see that the future will require us to find more work for idle hands. The work is there to do, to restore our environment, to teach the young, to repair our crumbling infrastructure and to rework it for a lower energy future. Those in the skilled trades are available for these tasks. Those who are unskilled will need to be brought into the workforce, paid decent wages and given reasonable working conditions. We can argue all we want about economic theory and market-determined wage rates for such people. But the alternative to providing decent wages and conditions for the least skilled among us is an army of unemployed, dissatisfied and potentially disruptive people whose potential contribution to society will be wasted because of a slavish devotion to free-market ideology. The fantasy that machines will more and more dominate our lives will only come true if there is the energy to fuel them. Absent that, we will be forced to rely increasingly on our hands and our feet to do the daily work of living. Vespasian understood that hands and feet need something to do that produces a living. The sooner we see that, the better. No post this week. I expect to post again on Sunday, November 20. As oil prices rose ever higher in the last decade, the optimists kept predicting rising production capacity and plummeting prices. Looks like they got it wrong. Read more.